The amount of information in the world today is almost unfathomable, and it’s increasing at a blistering pace. Analysts estimate that 90 percent of data in existence was created only in the last two years. What’s more, research group IDC predicts that by 2025, the world will be creating 163 zettabytes (163 trillion gigabytes) of data every year. In many ways, Connecticut is a state in search of an identity. Could we become known as the Cybersecurity state? In Europe, some already know us that way. After a very enlightening conversation with Art House, Chief Cybersecurity Risk Officer for the State of Connecticut toward the end of last year, he was gracious enough to come back to the Kelser offices this fall for a follow up interview to give us the latest on the global cybersecurity landscape and how Connecticut fits in. See if you notice the gap here: according to a recent report, 91% of cyberattacks start with a phishing email, yet cybersecurity training for employees is vastly underutilized in virtually every type of organization. How do you look at that statistic and not run immediately to human resources to make cybersecurity training mandatory for all employees? We can’t be totally sure, but we can offer some great background on the effect employees have on your company’s cybersecurity posture and tips for how to improve with training, and that’s exactly what we’re going to do in this blog post. 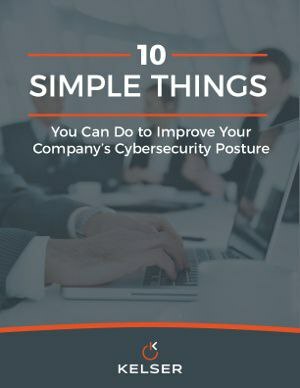 If you want to act now to begin tightening up the security habits of your employees or coworkers, download our recent complimentary ebook, 10 Simple Things to Improve Your Company's Cybersecurity Posture. A revolution is upon us. For the first time in the history of computers, the speed of storage has caught up with the rate of the computing resources that use that storage. Up until this moment, storage has always been the bottleneck. Although your computer can store some information in its primary memory, known as RAM, this storage has a physical limit. Past that limit, you'll need to read data from a secondary storage device such as a hard disk, which is a much slower process. If you've ever tried to copy a file from an external device onto your computer, for example, you'll notice that it takes much more time than opening a file that's already stored in your computer's memory. Post-season college basketball is in full swing, and as a sponsor of UConn Athletics, it’s something we get very excited about. Of course, we also get pretty revved up about layered cybersecurity pretty much any day of the week. Watching so much hoops this time of year, we’ve noticed that the principles of a good cybersecurity defense are reflected on the basketball court.